Imagine the ultimate sustainable green building… housing hundreds, perhaps thousands of people, drawing on geothermal power as an almost inexhaustible source of energy, and constructed to use the Earth itself to provide a natural means of cooling. This building is the very ideal of “Gizmo Green”, as defined by Steve Mouzon, since it draws upon cutting edge technological advances to provide ecological solutions. This magnificent building of our imagination even has its own light rail transit system. However, it also has a distinctly anti-urban quality about it. It can only be found in exurban locations, i.e. near to an urban location but not too close. Somehow, it reconciles an inherently contradictory nature into its very function. In short, this magnificent green building is all things to all people. Can such a green building really be imagined? 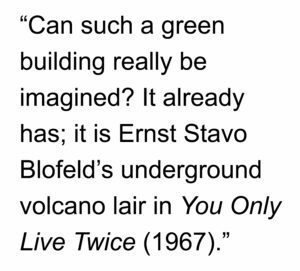 It already has; it is Ernst Stavo Blofeld’s underground volcano lair in You Only Live Twice (1967). 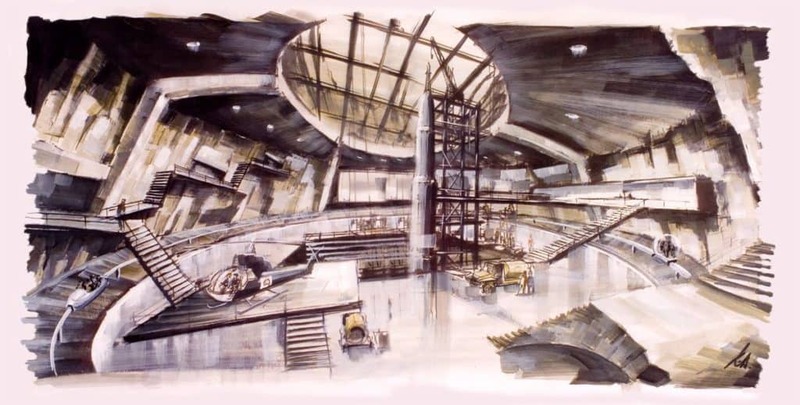 Ken Adams’s concept art for Ernst Stavo Blofeld’s underground volcano lair in You Only Live Twice (1967). Blofeld’s lair was built in a dormant volcano so presumably draws on geothermal power for energy. It was also built underground so the building uses the Earth itself to provide natural cooling for its interior. In the film, we see hundreds of Blofeld’s minions in the lair but presumably its capacity is much larger than portrayed… or the film’s budget would allow in terms of extras. The building even has its own small-scale light rail system as well as a helipad and space launch pad! The design also appears, in part, to draw upon Jeremy Bentham’s Panopticon in terms of visual surveillance. This is likely necessary since paranoia is a fundamental aspect of Blofeld’s autocratic power in the Bond films. 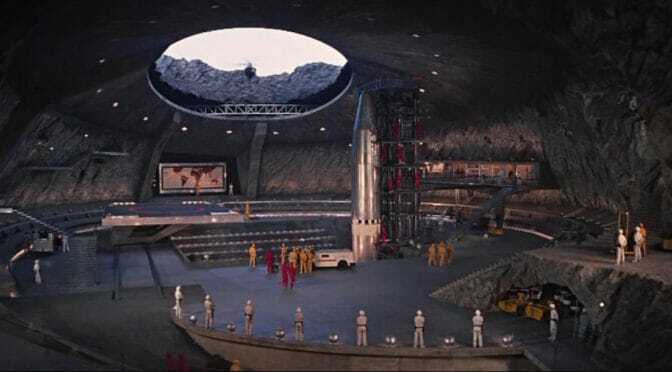 The design of Blofeld’s underground volcano lair was Michael Myers’ satirical inspiration for Dr. Evil’s ‘secret’ volcano lair in Austin Powers: The Spy Who Shagged Me (1999). It is fair to conclude the specifications for Dr. Evil’s lair were much the same as Blofeld’s in You Only Live Twice. Dr. Evil’s ‘secret’ volcano lair in Austin Powers: The Spy Who Shagged Me (1999). Blofeld and Dr. Evil are not the only ‘Bond’ villains to dabble in radical environmentalism. 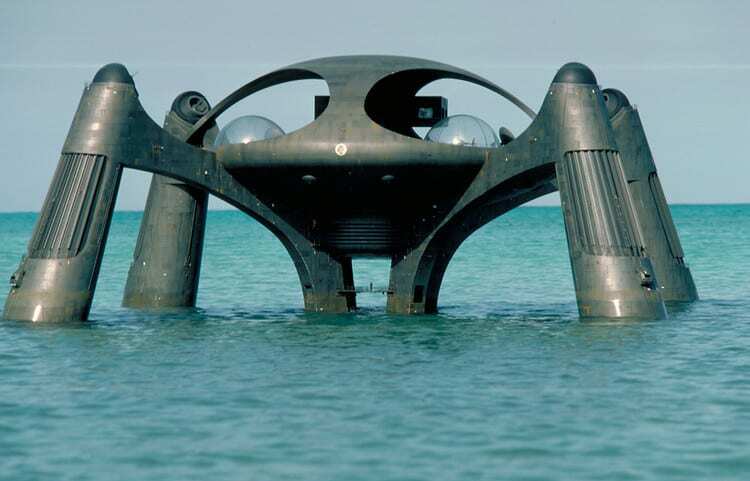 Karl Stromberg in The Spy Who Loved Me (1977) attempts to manipulate the United States and Soviet Union into launching global nuclear war while he is safely secluded in his underwater lair, Atlantis, with a chosen few to rebuild human civilization after the holocaust. Stromberg is a marine scientist who implicitly – and paradoxically – appears to have a radical environmentalist agenda. We say ‘paradoxically’ because his plan involves plunging the Earth into Nuclear Winter. His underwater lair, Atlantis, off the coast of Sardinia appears to draw on many of the same design specifications for Blofled’s lair with some modifications, i.e. drawing upon underwater thermal vents for energy, using the Mediterranean Sea for natural cooling of the structure, and so on. In the follow-up film, Moonraker (1979), the villain Hugo Drax explicitly engages in large-scale eco-terrorism by hatching a scheme to release a viral toxin on the Earth, which will destroy all human life but leave unharmed all other plant and animal life. 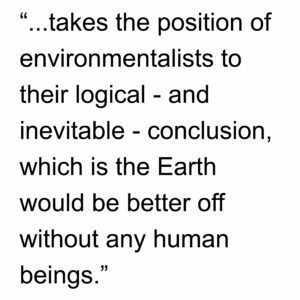 Drax takes the position of environmentalists to their logical – and inevitable – conclusion, which is the Earth would be better off without any human beings. Drax attempts to implement his dastardly plan while safely secluded in his moon base lair (also Michael Myers’ satirical inspiration for Dr. Evil’s moon base lair in Austin Powers: The Spy Who Shagged Me). Finally, the Bond villain in The Man with the Golden Gun (1974), Francisco Scaramanga, uses solar power for energy at his small-scale lair (in comparison to the Blofeld, Stromberg, and Drax hideouts) on an island in the South China Sea. Karl Stromberg’s underwater lair, Atlantis, in The Spy Who Loved Me (1977). Indeed, a strong radical environmentalism strain appears to be common to many of the most-noteworthy ‘Bond’ villains, more so than one might expect at first glance. Putting aside the issues of international nuclear terrorism and blackmail, counter-intelligence, terrorism, revenge, and extortion (the “Special Executive for…”, i.e. S.P.E.C.T.R.E. ), it is a legitimate question to ask whether ‘Bond’ villains represent some sort of ideal model for environmental protectionism in the world today. Is this the future of an Environmental Protection Agency and other government/non-governmental entities gone mad with power and their own narrow agenda? Are Ernst Stavo Blofeld and Dr. Evil the future faces of radical environmentalism? The Future Faces of Radical Environmentalism? 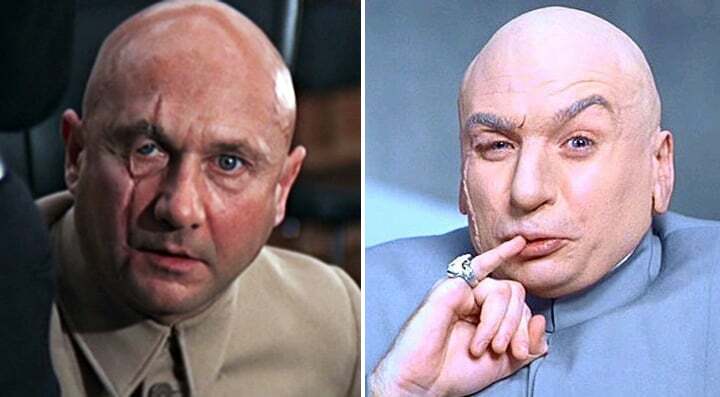 (left) Ernst Stavo Blofeld (Donald Pleasance) and (right) Dr. Evil (Michael Myers). Of course, in the end, James Bond and Austin Powers always defeat the villain. In contrast to the radical environmentalist strain of these villains, Bond and Powers are the ultimate urbane individualists. Powers lives in a bachelor pad (depending on the film and time period, above Piccadilly Circus or on the South Bank in central London). Bond apparently lives in a central London row house, presumably in the Bloomsbury or Chelsea neighborhood judging from an early scene in Live and Let Die (1973). Perhaps Bond even lives next door to Patrick McGoohan’s “Number Six.” Is there a Spy Row a couple of blocks over from Saville Row in London? In any case, in the end, the traditional urbanist always defeats the radical environmentalist to save the day and the world… and get the girl. 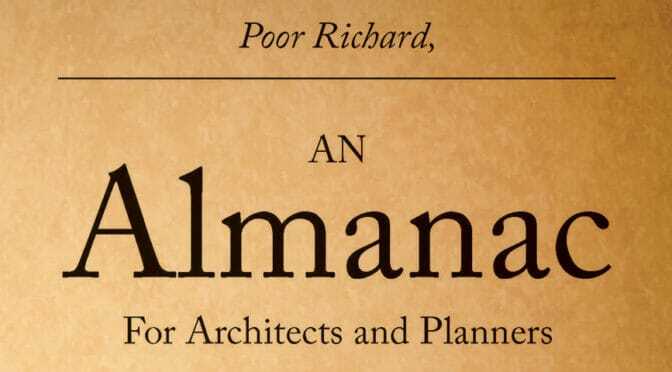 I am tempted to win your favor by declaring I wrote this Almanac for Planners solely for the public good. However, this is insincere and you are too wise for the deception of this pretense. The fact is I am excessively poor and, unfortunately, excessively wifeless. To address both problems, I must begin to make some profit since every potential wife always asks, “What kind of car do you drive?” I always have to reply, “I walk”, and the potential wife thinks I am a deviant. 21. 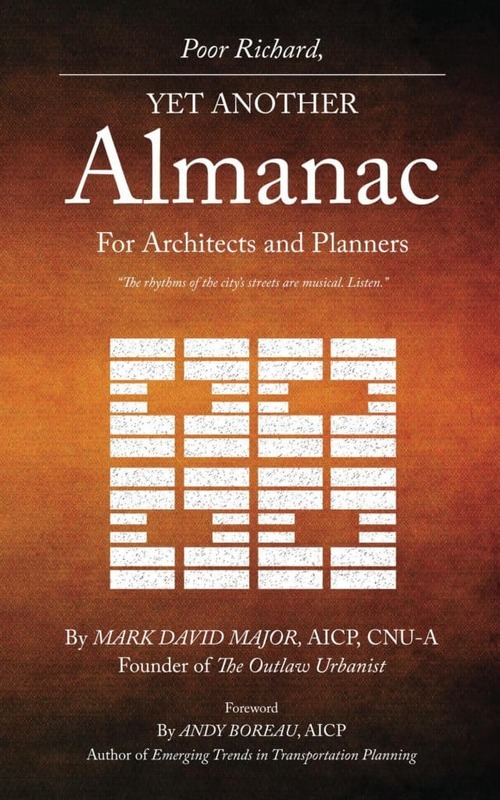 Ancient Greeks and Romans built civilization on the regular grid. It is arrogant to think we know better. 22. Underestimating the instrumental power of the regular grid is a mistake and often leads to its abuse. 23. Regular grids are about right angles. Deformed grids are about open angles. Sprawl is where angles go to die. 24. Regular grids are relentless in their rightness… think about it. 25. Thomas Jefferson gave us the American regular grid. A committee of roadway engineers gave us suburban sprawl. Always walk with giants, never ride in the clown car. 26. Real estate agents are salesmen. They are natural-born obfuscators. Never believe a word they say. 27. Standing on your head while looking in a mirror is usually the best way to detect the realtor’s truth. 28. Real estate agents sell space, not walls. 29. If urban planning isn’t about good design, then it’s about nothing and worth as much. 30. “Whatever is best for me” is not a valid philosophy for urban planning… or living. The Issue 4 cometh soon! AUTHOR’S NOTE: This is a guest editorial in support of Florida Hometown Democracy originally published in October 2010 on the online magazine, Metro Jacksonville. Voting Yes for Amendment 4 this November 2nd is a vote for a better, smarter Florida. Our real estate and development industry is a dinosaur; equally dull in its collective wisdom and just as extinct. Over the last 25+ years, our real estate development industry has been driven by one arrogant and fatal assumption: this is what makes us the most money, therefore, this is what the people really want. It’s akin to offering a man dying of thirst in the desert a shot of bourbon to forget his troubles (“oh, and here’s a Golden Calf to help you pray for help”). The dying man wants… needs water. But the profit margins on bourbon and golden calves meet the quarterly profit projections of Wall Street. Now Amendment 4 comes before the voters this November 2nd to offer water in the desert. Predictably, the entrenched, moneyed interests in Tallahassee and town halls across the state have risen in opposition to Amendment 4. In the wilderness of the desert, they proclaim, “Don’t drink the water! Water has a 100% mortality rate! Anybody who has ever tasted water has died!” But the voters know better. Amendment 4 proposes to make amendments to local comprehensive plans subject to voter approval. 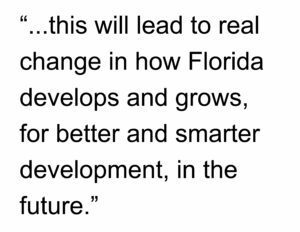 And this will lead to real change in how Florida develops and grows, for better and smarter development, in the future. Once the inevitable economic recovery appears, our real estate and development businesses will still make money (a lot of money, in fact). But the “this is the way we’ve always done it” business models they have relied for the last 25+ years will have to adapt when the voters approve Amendment 4 this November 2nd. Americans are optimists. We believe a vote can change our world. In 2006 and 2008, we voted to change direction after the Republican Party betrayed its core principles. Now, in 2010, we are once again preparing to vote for unprecedented change after the disappointment of the last 2 years. The media pundits and talking heads are pontificating about “the angry voter”, as represented by the enthusiasm of the Tea Party movement. But people don’t get angry and enthusiastically go out to vote unless they are optimists. The optimist votes because we still believe our vote matters and we can change things for the better. We stubbornly cling to our optimism despite being bombarded by the ‘conventional wisdom’ of cynics who prey on the fear we can never change a corrupt system dominated by moneyed interests, lobbyists and entitled self-serving incumbents (of both parties). I urge you to exercise your optimism by voting Yes on Amendment 4 this November 2nd for a better and smarter Florida. Mark Major, AICP was the Chair of the First Coast Section, Florida Chapter of the American Planning Association from 2005-2008. We are radical traditional urbanists on a mission to expose the heathens who are destroying our cities. Our purpose is to radicalize anew the debate about the future of our cities. 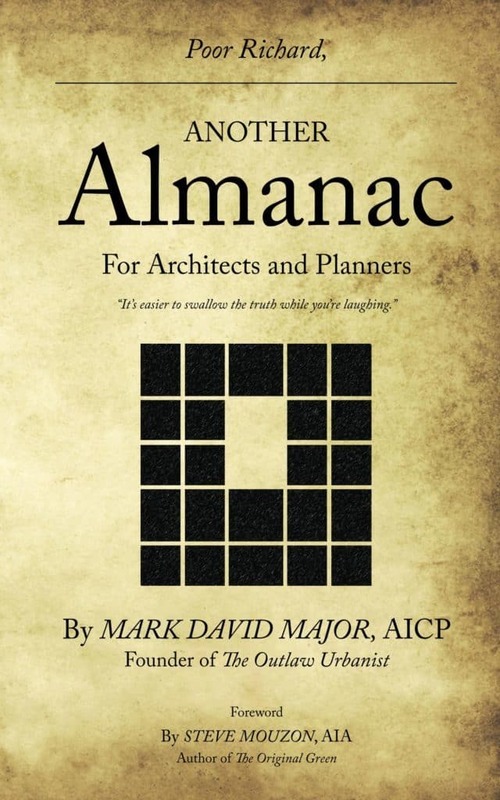 Our goal is to utterly eradicate the intellectual fallacy of the tired paradigms seizing our urban design and planning, real estate development, engineering, and architectural professionals since the early-to-mid 20th century. 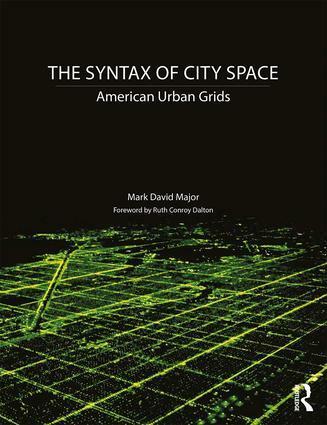 The catastrophic consequences of these paradigms are evident: more than a century of suburban sprawl, economic failures, social isolation, and urban dysfunction. They are failed paradigms, dinosaurs that do not recognize or will not acknowledge their own extinction. We are outlaws. 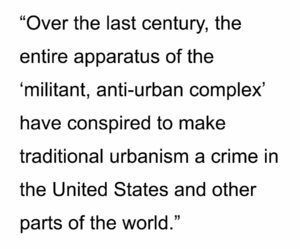 Over the last century, the entire apparatus of the ‘militant, anti-urban complex’ have conspired to make traditional urbanism a crime in the United States and other parts of the world. Federal, State and local planning and development policies, laws and regulations – aided and abetted by the self-serving dogma of professional organizations such as the American Association of State Highway and Transportation Officials and the American Planning Association and advocacy groups promoting a radical environmentalism – have conspired to make us outlaws. However, we refuse to serve time in their prison of suburbs now littering the landscape. Our doctrine is suburban disobedience. The emergence of The New Urbanism in the early 1980s — and the later founding of the Congress for New Urbanism in 1992 — changed the debate about how to best design and build our cities of to-morrow. At the same time, the hard science of cities has time and time again issued findings that unquestionably prove the economic and social benefits of traditional urban models of living, working, and playing. This had led to a perceptible shift over the last three decades. However, it is not enough. We need revolution, not evolution. We need concerted action to overthrow the institutional inertia of our businesses, governments, and professions, which continue to drag our cities down a cul-de-sac, despite the best efforts – sometimes misguided – of many people. Like all cul-de-sacs, that path leads nowhere. Governments continue to enforce and tweak – rather entirely discard – zoning and environmental regulations that are the principal source for our suburban sprawl nightmare. 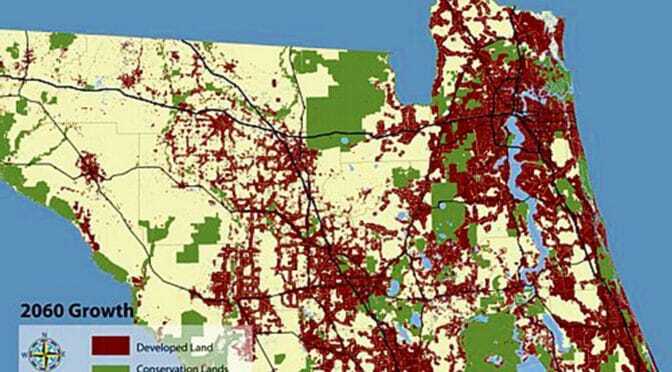 Corporations continue to ‘build to code’ and construct suburban sprawl at an alarming rate. Multiple generations have now been born, raised, and will die trapped within a suburban nightmare from which they cannot wake. We are all guilty for these circumstances. The right-wing NIMBYs who hide behind the walls of their gated communities are guilty (“I’ve got mine, Jack, so screw you”). The left-wing radical environmentalists who protect a puddle of mud after a light shower are guilty (“It’s land and it’s wet, so it’s a wetland”). Those who drive their car around for fifteen minutes looking for a more convenient parking space are guilty (“God gave me legs but I can’t walk”). Because we are all guilty, we are also all responsible for sweeping away the mess. 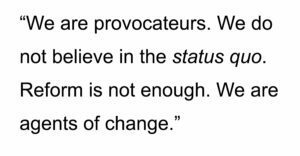 We are provocateurs. We do not believe in the status quo. Reform is not enough. We are agents of change. Our entire system of city building must be torn down and rebuilt from scratch. A city built on foundations of sand cannot stand. We will challenge the flawed assumptions of our leaders. We will support positions of the political left and political right in the United States and elsewhere in the world. We will also oppose many of the sacred cows held by the political left and political right in those same places. We will challenge you to change. We ask you to challenge us. Join us in our mission to save our cities.